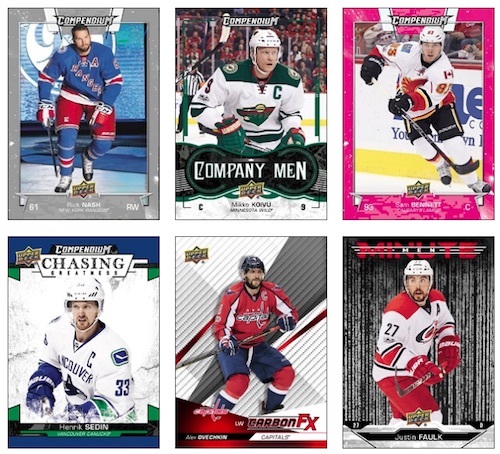 Providing overall coverage unmatched for NHL cards, 2017-18 Upper Deck Compendium is a three-series set issued exclusively through the ePack format. Just as with the 2016-17 product, the ePack program offers digital cards that can be turned into physical versions. The end result is a massive 2017-18 Upper Deck Compendium Hockey checklist of 900 base cards (300 per series) with Magenta (1:3 packs) parallels, alongside different digital inserts for every release. Series 1 includes Carbon F/X, Company Men and Minute Men, each at 1:6 packs. In addition to its own batch of base cards, there are also Series 2 inserts: Focus Factor, "C" and Tough Customers. Series 3 brings Next Up, SUPERstitious and Uncut. Finally, case-hit Chasing Greatness (1:288 packs) offers 10 cards per series from the 30-card continuation line. 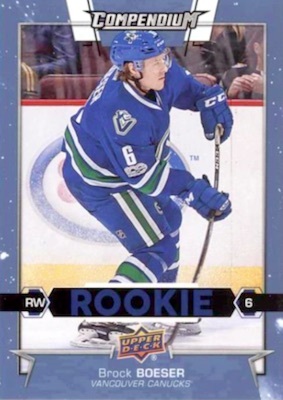 However, it is not just a virtual collection as 2017-18 Upper Deck Compendium Hockey also features physical card options for all of the base subjects, as well as more limited achievement cards. These can't be pulled directly from packs, but they can be unlocked using the digital collection. For the base set, collectors can elect to bring the cards home via exclusive parallels. Blue is earned by combining ten copies of any one base card. In turn, 10 Blue versions can be used to make one Gold parallel. The remainder of the 2017-18 Upper Deck Compendium Hockey checklist is composed of physical achievement cards redeemed by completing sets. If you build and redeem the 300-card base set (or any parallel set including Magenta), you can earn three SP Achievement cards. 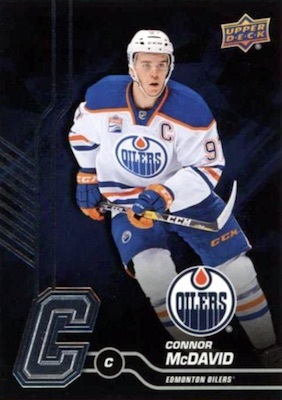 If you earn all nine SP cards (three per series), you can redeem these for #SP10 of Connor McDavid. 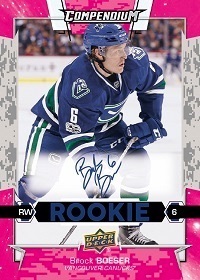 Those that earn the Magenta version of #SP10 can redeem that card for a random Magenta Parallel RC Autograph Achievement card for Brock Boeser, Clayton Keller, Colin White or Josh Ho-Sang. Limited to just the first 10 collectors, if you complete the 30-card Chasing Greatness set, this can be redeemed for a Chasing Greatness Autograph Achievement card of Wayne Gretzky. There are also Insert Achievement cards issued when you finish any full insert set. 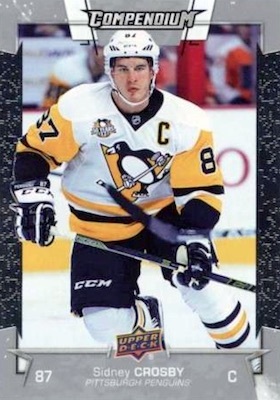 After unlocking all nine insert achievements (three per series), collectors can decide to redeem these for the Grail Glory Achievement card honoring the Pittsburgh Penguins. 2017-18 Upper Deck Compendium Hockey pricing is $0.99 per pack, $22.99 per box and $269.99 per case. Additional info about the physical versions can be found on the Product Details tab. 900 total cards with 300 per series. Shop physical parallels on eBay. DIGITAL PARALLELS: Magenta (1:3 ePacks). PHYSICAL PARALLELS: Blue, Gold, Printing Plates 1/1. 10 cards. Shop physical Achievement cards on eBay. Physical cards earned by building digital sets. PARALLEL CARDS: Magenta, Blue, Gold. Physical cards earned by building digital insert sets. I think that the removal of free packs has hurt how attractive this product is to most epack users. And where can one buy these epacks Trey? If I understand well, you can ask them to send you the cards you pull in the ePack, even the base ones, right? Cheers! ePack is the digital platform from Upper Deck. You “open” the packs online and then you redeem certain options for physical cards and also combine digital cards to make physical versions. Yes Trey, I understand that, but where exactly can we purchase them? What website? I looked everywhere and I cannot find them. Thanks a bunch Trey. I admit I don’t quite understand. Can we have the physical base cards or just the blue parallel once we’ve put together 10 copies of the same base card? There is no option for the physical base cards other than through parallels. If you combine 10 digital base cards of the same player, you get the ability to order the physical blue. Checklist is OK but the design of this year Compendium is just awful. I see Upper Deck Compendium 2018-19 showing up on ebay, is there a checklist available?